Long-term dopamine replacement therapy in Parkinson's disease leads to the development of disabling involuntary movements named dyskinesias that are related to adaptive changes in striatal signaling pathways. The chronic transcription factor ΔFosB, which is overexpressed in striatal neurons after chronic dopaminergic drug exposure, is suspected to mediate these adaptive changes. Here, we sought to demonstrate the ability of ΔFosB to lead directly to the abnormal motor responses associated with chronic dopaminergic therapy. Using rAAV (recombinant adenoassociated virus) viral vectors, high levels of ΔFosB expression were induced in the striatum of dopamine-denervated rats naive of chronic drug administration. Transgenic ΔFosB overexpression reproduced the entire spectrum of altered motor behaviors in response to acute levodopa tests, including different types of abnormal involuntary movements and hypersensitivity of rotational responses that are typically associated with chronic levodopa treatment. JunD, the usual protein partner of ΔFosB binding to AP-1 (activator protein-1) sites of genes, remained unchanged in rats with high ΔFosB expression induced by viral vectors. These findings demonstrate that the increase of striatal ΔFosB in the evolution of chronically treated Parkinson's disease may be a trigger for the development of abnormal responsiveness to dopamine and the emergence of involuntary movements. Long-term dopaminergic therapy of Parkinson's disease (PD) is associated with motor complications including involuntary movements (dyskinesias) that can be attributed to several factors related to disease progression and chronic exposure to drugs (Jenner, 2008). These chronic events induce transcriptional changes in the striatum often mediated through chronic transcription factors (Hope et al., 1994; Chen et al., 1997; Hiroi et al., 1998) that are isoforms of ΔFosB, a truncated splice variant of FosB (Nakabeppu and Nathans, 1991; Chen et al., 1997; Nestler et al., 2001). ΔFosB is highly stable and induces long-lasting effects (Ulery et al., 2006) forming heterodimers with JunD that bind to the activator protein-1 (AP-1) site of multiple late response genes (Hope et al., 1994). Stable ΔFosB-regulated genes may thus induce the pathogenic cascades responsible for altered motor responses to dopaminergic drugs. In animal models of PD, striatal ΔFosB expression increases after nigrostriatal lesions and to even higher levels after chronic dopaminergic treatment (Doucet et al., 1996; Vallone et al., 1997; Andersson et al., 1999; Calon et al., 2000). Furthermore, ΔFosB upregulation is maintained for weeks after treatment discontinuation indicating induction of persistent effects (Andersson et al., 2003). Yet, it has been difficult to ascertain a mechanistic relationship between changes in ΔFosB expression and the development of levodopa-induced dyskinesias. Although ΔFosB expression increases initially after dopamine depletion (Dragunow et al., 1995) and continues to rise progressively during chronic treatment correlating with the duration of drug exposure (Valastro et al., 2007), the critical ΔFosB level needed to trigger abnormal motor responses is not established. However, a linear correlation between ΔFosB levels and the severity of dyskinesias was found in recent studies of parkinsonian monkeys (Berton et al., 2009). Additionally, in these monkeys, transgenic overexpression of ΔJunD, which lacks a transactivation domain and therefore acts as a dominant-negative inhibitor of ΔFosB, reduced the severity of dyskinesias developed after chronic treatment. In patients, striatal ΔFosB overexpression correlates inversely with dopamine content, suggesting a relationship with disease progression, which is usually accompanied by long-term drug exposure (Tekumalla et al., 2001). Together, the preceding data strongly support a link between ΔFosB and the genesis of dyskinesias. One way to isolate the function of ΔFosB and test its critical role in the development of dyskinesias is to model the state of high ΔFosB expression using viral vector-mediated gene transfer (Olausson et al., 2006) in the absence of chronic drug exposure. If ΔFosB were responsible for altered responses to dopaminergic treatment, we would expect this approach to replicate the involuntary movements seen with chronic drug administration. To address this hypothesis, we infused viral vectors carrying the ΔFosB cDNA into the striatum of rats with nigrostriatal lesions but naive of chronic drug treatment. These rats require chronic drug administration to develop motor complications [i.e., abnormal involuntary movements (AIMs) (Lundblad et al., 2002) and hypersensitivity of rotational responses (Papa et al., 1994; Marin et al., 2006)]. Transgenic ΔFosB expression alone consistently induced all behavioral changes including AIMs after the first acute levodopa administration. All procedures were approved by the Institutional Animal Care and Use Committee and were in accordance with the National Institutes of Health Guide for the Care and Use of Laboratory Animals. Adult male Sprague Dawley rats (240–260 g; n = 34) were injected unilaterally in the medial forebrain bundle with 8 μg of 6-hydroxydopamine (6-OHDA) under stereotaxic surgery as described previously (Papa et al., 1994). Three weeks after surgery, rats were tested for rotational responses to a subthreshold dose of apomorphine (0.05 mg/kg), and animals exhibiting >100 turns (total) were selected for the study because such responses correspond to >95% dopamine neuron loss. Rats were randomly divided into four groups; two groups were assigned to striatal infusions of rAAV-ΔFosB or rAAV-GFP (n = 7 and 6, respectively), and the other two groups to chronic treatments with levodopa or saline (n = 13 and 8, respectively). One week after apomorphine screening, rats in the virus infusion groups were evaluated for their baseline motor responses (rotation and AIMs) (see below, Behavioral assessment) to levodopa methyl ester plus benserazide (25 and 6.25 mg/kg, respectively; dissolved in saline and given intraperitoneally). These tests demonstrated that the animals did not show levodopa-induced dyskinesias before viral vector-mediated gene transfer. The following day, these groups were subjected to stereotaxic surgery for striatal infusions of viral vectors (see Fig. 1A). The other two groups began levodopa or saline treatments 1 week after apomorphine test, and their baseline responses were assessed after the first levodopa injection (morning of chronic treatment day 1). AIMs induced by acute levodopa administration after transgenic overexpression of ΔFosB in the striatum. A, Timeline of experiments. Studies began for all rats with unilateral 6-OHDA lesions of the nigrostriatal pathway followed by apomorphine screening for selection of animals with complete lesions (see Materials and Methods). The red arrow represents the timeline for groups of viral vector (rAAV) infusions, and the blue arrow, for the groups of chronic daily drug treatment. Rats assigned to rAAV infusion (red; rAAV-ΔFosB or rAAV-GFP groups) were tested with levodopa for baseline responses on day 0; the following day (corresponding to day 28 since 6-OHDA lesion), the viral vectors were infused in the striatum, and 4 weeks later (day 56) weekly acute levodopa tests began and continued until the 12th week. In parallel, rats assigned to chronic drug treatment (blue; levodopa or saline groups) were treated with twice daily injections beginning on day 1 (corresponding to day 28 since 6-OHDA lesion) and continuing for 29 d (day 57). In the chronic levodopa group, responses to levodopa were assessed at baseline and after every week of daily treatment for 4 weeks (days 1, 8, 15, 22, and 29). In the chronic saline group, responses to levodopa were assessed at the beginning and the end of treatment (days 1 and 29). All levodopa tests in all four groups were performed with intraperitoneal administration of levodopa methyl ester plus benserazide (25 and 6.25 mg/kg, respectively). B–E, Total AIMs (B), limb dyskinesias (C), masticatory dyskinesias (D), and axial dystonia (E) shown after striatal infusions of rAAV-ΔFosB (n = 7) or rAAV-GFP (n = 6). The arrow in the x-axis indicates striatal infusion of viral vectors performed 1 d after baseline levodopa test. In the fourth week, *p < 0.01 versus baseline. In all other time points, *p < 0.01 and ∧p < 0.05 versus baseline and versus week 4 within the same group. **p < 0.01 versus the same time point in the other group within each graph. F–I, Total AIMs (F), limb dyskinesias (G), masticatory dyskinesias (H), and axial dystonia (I) shown after chronic treatment with levodopa (n = 13) or saline (n = 8). *p < 0.01 versus day 1 (baseline) (one-way and two-way ANOVAs for repeated measures followed by Fisher's PLSD; error bars indicate SEM). The mouse ΔFosB cDNA or EGFP (enhanced green fluorescent protein) cDNA was cloned into AAV plasmid (recombinant adenoassociated virus serotype 1, rAAV2/1; Stratagene) with multiple cloning sites (pAAV-MCS) to generate pAAV-ΔFosB or pAAV-GFP, respectively (Mochizuki et al., 2001; Yasuda et al., 2007). Plasmids were constructed with a cassette containing chicken β-actin-promoter/cytomegalovirus enhancer (CAG promoter) that yields high expression in striatal cells. pAAV-ΔFosB and pAAV-GFP were tested for effective transgene expression in HEK293T cells using Western blotting with the primary antibodies anti-FosB (sc-28213; at 1:100 dilution; Santa Cruz Biotechnology), anti-green fluorescent protein (GFP) (AB3080; 1:200 dilution; Millipore), and anti-β-actin as an internal control. The anti-FosB antibody used is highly specific for the N terminus of FosB/ΔFosB, and the abundant expression of ΔFosB from the plasmid is seen as an ∼35–37 kDa band. To generate viral particles, HEK293 cells were cotransfected with pAAV-ΔFosB, or pAAV-GFP along with pHelper and Pack2/1 using a standard calcium phosphate method, and 48 h after transfection the cells were harvested. Crude recombinant adenoassociated virus (rAAV) supernatants obtained by repeated freeze/thaw cycles were processed for gradient ultracentrifugation. The fractions containing high-titer rAAV were collected and used for injecting animals. The number of rAAV genome copies was semiquantified by PCR within the cytomegalovirus promoter region of the vector using primers 5′-GACGTCAATAATGACGTATG-3′ and 5′-GGTAATAGCGATGACTAATACG-3′. Final titers were 4 × 109 genome copies/ml (infused doses) (Yasuda et al., 2007). Vectors coding for ΔFosB (AAV-ΔFosB) or the control protein GFP (AAV-GFP) were injected at equal particle doses stereotaxically into the middle-posterior area of the striatum on the side ipsilateral to the 6-OHDA lesion, at anterior, 8.4, and lateral, 4.4 mm from the middle of the interaural line, with two infusions at different depths, 6.2 and 5.2 mm from surface of the skull of 3 and 2 μl each. The viral vectors were injected in the middle portion of the posterior striatum to allow for diffusion within the limits of the nucleus. These injections were done with a Hamilton microsyringe at a rate of 0.5 μl/min. Rats did not receive any drug treatments during the following 4 weeks. Acute levodopa tests were initiated 4 weeks after the virus infusions and continued weekly until completion of 12 weeks (see Fig. 1A). Animals did not receive any drug treatment between weekly levodopa tests. In the two chronically treated groups that did not receive AAV viral vector, levodopa or saline was administered twice daily by intraperitoneal injections (morning and afternoon) for 4 weeks. On day 1, animals in both groups received levodopa as the first morning treatment and their motor response was assessed by measuring rotation and scoring AIMs (see below, Behavioral assessment). Animals in the chronic levodopa treatment group were reevaluated weekly after the morning dose on days 8, 15, 22, and 29 (see Fig. 1). Animals in the saline group received saline injections twice daily for 4 weeks, and their response to levodopa was reassessed only on the morning of day 29 for comparison with their baseline response on day 1. AIMs were scored using the standardized scale described by Lee et al. (2000) that includes the four classic categories as follows: 1, limb dyskinesias; 2, axial dystonia; 3, masticatory (orolingual) dyskinesias; and 4, contraversive rotation. Animals were observed and scored directly by an examiner every 15 min for 210 min after levodopa injection. In addition, the examiner videotaped the animals in every interval for subsequent scoring by a blinded examiner. To increase the specificity of behavioral data, contraversive rotation was not included in the analysis of total AIMs. Development of circling behavior depends on levodopa doses more than repeated exposure, and its interpretation has been controversial because it also represents the antiparkinsonian effect of levodopa (Papa et al., 1994; Marin et al., 2006). Scores in each interval were added to obtain a total value of the AIMs category for each animal in each test. Rotational behavior was measured using an automated rotometer for the whole duration of the levodopa response. The program counted rotations in either direction every 5 min intervals. Full circle rotations contralateral to the lesion were computed for analysis of levodopa responses. Parameters of rotation were calculated as previously described (Papa et al., 1994; Marin et al., 2006). Peak rotation was taken from the maximum number of contralateral turns in any 5 min interval. Total rotation was not used in the behavioral analyses because values usually appear unchanged after chronic treatment because of counteracting effects of peak increases and shortening of duration. Animals were killed under deep anesthesia 12 h after the last levodopa or saline injection, and blocks of the brain were separated assigning alternating portions of the striatum for postfixation and immunostaining, or storing at −80°C for Western blots. Brain tissue from all animals was processed for immunohistochemistry (IHC), and those in the rAAV-GFP group for immunofluorescence as well. Free-floating sections (30 μm thickness) of the postfixed blocks of the brain were processed beginning with PBS rinses and quenching endogenous peroxidase activity by incubation with H2O2 for 10 min. After repeating PBS rinses, sections were preincubated in 10% NGS/1% bovine serum albumin/PBS for 30 min and subsequently incubated with one of the following primary antibodies: rabbit polyclonal anti-FosB (sc-28213; 1:100 dilution; Santa Cruz Biotechnology), rabbit polyclonal anti-GFP (AB3080; 1:200 dilution; Millipore Bioscience Research Reagents), or rabbit polyclonal anti-JunD (sc-74; 1:800 dilution; Santa Cruz Biotechnology). Sections containing substantia nigra were processed similarly and incubated with the primary antibody mouse monoclonal anti-tyrosine hydroxylase (TH) (MAB318; 1:500 dilution; Millipore Bioscience Research Reagents). After overnight incubation at 4°C, sections were rinsed in PBS and incubated in a 1:200 dilution of biotinylated goat anti-rabbit IgG (Vector Laboratories) for 1 h, and then rinsed in PBS. Sections were transferred to a Vectastain ABC kit (Vector Laboratories) for 1 h. A 3,3′-diaminobenzidine kit (Vector) served as chromogen in the subsequent visualization reaction. After a series of dehydration procedures, sections were mounted on slides and coverslipped. Control experiments were performed by omission of primary antibody. Immunoreactive cells were counted by delimited areas in each striatal region. The posterior–lateral striatal areas corresponding to sensorimotor regions were selected for comparison across groups. However, protein expression after virus infusion was similar in all the posterior areas of the striatum because of virus diffusion from the site of injections. Striatal areas were delineated using the Olympus CAST 2.0 system (Olympus) from six equally spaced sections representing most of the striatal volume from the rostral tip to the level of globus pallidus where the striatum could still be well delimited. In each of the six sections, cells were manually counted by placing a fixed counting frame, which was moved by an XY stepper motor (400 × 400 μm). The program then created a series of uniform and systematically sampled fields of vision throughout the marked region. The total number of cells was estimated based on the field sampled by the program. Striatal sections were incubated for 10 min in 5% normal donkey serum in PBS and incubated overnight at 4°C in the primary antibody solution (anti-GFP, same as above). Sections were rinsed in PBS and incubated in FITC-conjugated donkey anti-rabbit IgG (1:200 dilution; Jackson ImmunoResearch Laboratories). Subsequently, sections were again rinsed in PBS, mounted on slides, coverslipped, and examined with confocal microscopy. Digitized images were analyzed for distribution of GFP-immunoreactive cells. The left and right striata were dissected individually from frozen brain blocks and homogenized in a lysis buffer with protease inhibitor. The homogenates were centrifuged, and the supernatants were analyzed for protein content using a BCA protein assay kit. Equal quantities of total protein (10 μg/well) were separated by SDS-PAGE (10% gels) and transferred onto PVDF (polyvinylidene fluoride) membranes. Membranes were blocked in TBS-T containing 5% nonfat dry milk and incubated overnight at 4°C with the primary antibody. The same antibodies used for IHC were used for immunoblotting with the following dilutions: 1:1000 for anti-FosB/ΔFosB, and 1:4000 for anti-JunD. In addition, an antibody against glyceraldehyde-3-phosphate dehydrogenase (GAPDH) was used as internal control. After four 15 min rinses in TBS-T, membranes were incubated with horseradish peroxidase-conjugated anti-rabbit antibody (1:2000 dilution; Santa Cruz Biotechnology) in TBS-T for 1 h at room temperature. The membrane was washed three times for 10 min each in TBS after each antiserum application. Bands were visualized by ECL and quantified by densitometric scanning of films with a computer-assisted program (NIH Image 1.63). AIM scores were graded within wide ranges (values included none integer), and, thus, these data composed continuous variables. Behavioral, IHC, and biochemical data (quantitative data) were examined for assumptions of normal distribution and homogeneity of variances. If needed, adjustments were made for meeting the criteria for ANOVA. Comparisons between time points of evaluation within a group used ANOVA for repeated measures, and post hoc tests [Fisher's protected least significant difference (PLSD)] were applied when appropriate according to the significance indicated by the F value. For differences of behavioral data in each set of treatment groups (viral vectors or chronic drug treatments), we used two-way (time point and treatments) repeated-measures analysis with two time points, baseline and end of testing (e.g., weeks 4 and 12 in the virus groups) because these were the two critical points in all treatment groups. Differences of biochemical data in each set of treatment groups and between brain sides were also analyzed with two-way ANOVAs. For interpretation of behavioral data, significance was taken at p < 0.01; however, some differences particularly in the rAAV-GFP group were significant only at p < 0.05 and marked as such in the figures. To test whether striatal ΔFosB overexpression leads to changes in levodopa-induced motor responses, rAAVs carrying ΔFosB or GFP cDNA were infused into the denervated striatum of rats that had previously received unilateral 6-OHDA lesions of the nigrostriatal pathway (Fig. 1A). Behavioral evaluations in response to acute levodopa tests started the day before the stereotaxic infusion of rAAV-ΔFosB or rAAV-GFP vectors to obtain baseline scores, and resumed 28 d after the viral infusion at weekly intervals until the 12th week (weeks 4–12) (Fig. 1A). None of the animals in either group showed AIMs at the baseline levodopa test performed before the viral infusion. Rats that received rAAV-ΔFosB began to exhibit AIMs even in response to the first intraperitoneal injection of levodopa 4 weeks after the intrastriatal viral vector infusion, as opposed to control animals infused with rAAV-GFP and tested with the same schedule of weekly levodopa doses (Fig. 1). Thus, significant AIMs developed after a minimal exposure of two levodopa injections (the day before and at 4 weeks after viral vector infusion) in the rAAV-ΔFosB group. 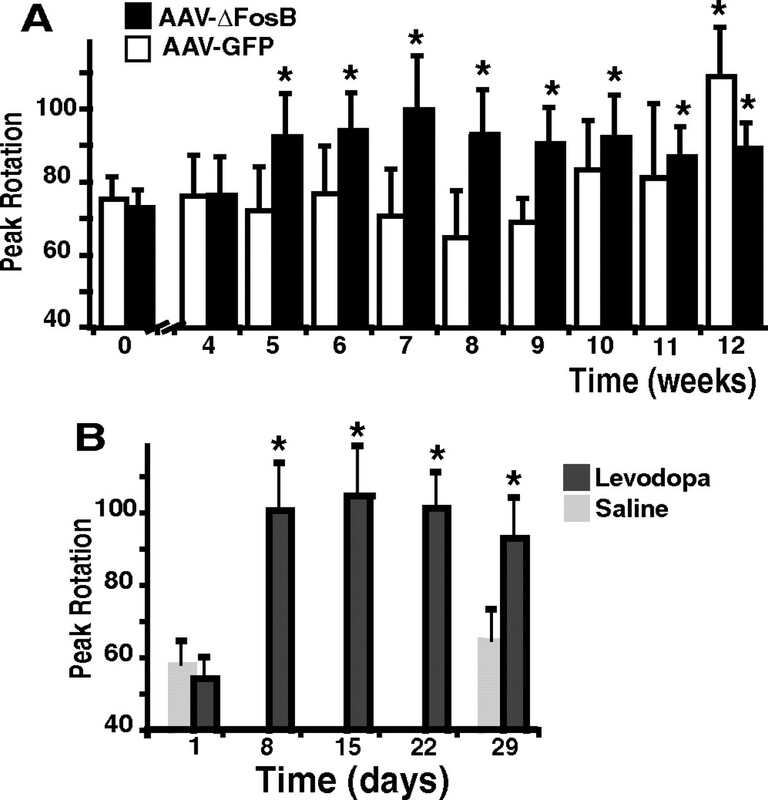 Rats in the rAAV-GFP group remained without significant AIMs for several successive weeks of acute levodopa tests, whereas rats in the rAAV-ΔFosB group had progressively more severe AIMs over the same time period. Limb dyskinesias, the most specific category compared with other behaviors included in total AIMs, were significantly present in the rAAV-ΔFosB group at the earliest levodopa test (Fig. 1C). Similarly, masticatory dyskinesias were also consistently expressed with the first levodopa injection after the rAAV-ΔFosB infusion (Fig. 1D). Although the progression of axial dystonia was more variable across animals, a difference in this category between the two viral vector groups was also evident during the later tests (Fig. 1E). Different doses of rAAV-ΔFosB are needed for additional inferences about the relationship between ΔFosB and the expression of purely dystonic movements. By the 11th week, when animals had been exposed to levodopa nine times, AIMs and particularly limb dyskinesias began to appear in the rAAV-GFP-infused animals, although their scores remained markedly lower than those in the rAAV-ΔFosB group even at the latest time points. None of the animals including those in the rAAV-ΔFosB group exhibited dyskinesias without levodopa administration. The selection of an optimum levodopa dose (25 mg/kg) was critical for these experiments to induce consistent expression of all categories of AIMs across animals in tests of chronic drug exposure (Lee et al., 2000; Marin et al., 2006) since lower doses usually induce variable severity of dyskinesias in only 50% of animals (Cenci et al., 1998). For comparison with viral vector-infused rats, two other parallel groups of rats with unilateral 6-OHDA lesions were treated chronically with levodopa or saline as twice daily injections for 4 weeks using the same intraperitoneal doses of levodopa as for the weekly tests in the rAAV groups (Fig. 1A). AIMs developed gradually in all levodopa-treated rats as opposed to saline-injected animals that were tested with levodopa on days 1 and 29 (Fig. 1F–I). The magnitude of AIMs observed with chronic levodopa treatment was comparable with that observed with acute levodopa tests after striatal rAAV-ΔFosB infusions; total AIMs scores peaked between 50 and 60 points in both groups (Fig. 1B,F). Intrastriatal infusion of rAAV-ΔFosB also led to the development of other motor complications of levodopa responses. In the rodent model, daily levodopa treatment for several weeks induces changes of the rotational responses characterized by shortening of duration and increase of intensity that have been interpreted to be equivalent to the motor fluctuations of parkinsonian patients (Papa et al., 1994; Marin et al., 2006). Although the shortening of rotation may also depend on presynaptic factors related to chronic drug exposure, the increase of rotational intensity (hypersensitive response) may be produced by postsynaptic mechanisms. The number of contralateral rotations measured at the peak of turning increased rapidly in the rAAV-ΔFosB group showing development of hypersensitivity 5 weeks after viral vector infusion (Fig. 2A). In contrast, control rats that were infused with rAAV-GFP exhibited a significant increase in peak rotations only at the 12th week. Enhanced rotational responses develop with repeated exposure to dopaminergic drugs and can be viewed as an equivalent to the exaggerated responsiveness of fluctuating PD patients (Vallone et al., 1997; Marin et al., 2006). Hypersensitivity of rotational responses developed fully in denervated rats exposed to twice daily levodopa administration during the first week of treatment (Fig. 2B). The magnitude of these changes was comparable with those seen in the rAAV-ΔFosB group (averages between 90 and 100 turns per 5 min interval in both groups) (Fig. 2). Hypersensitivity of rotational behavior induced by acute levodopa administration after transgenic overexpression of ΔFosB in the striatum. A, Peak rotational responses shown after striatal infusion of rAAV-ΔFosB (n = 7) or rAAV-GFP (n = 6). Peak rotation was measured as the maximum number of contralateral turns in any 5 min interval. In the rAAV-ΔFosB group, a significant difference occurred at week 5 (second levodopa injection after virus infusion), whereas in the rAAV-GFP group it was attained only at week 12. *p < 0.01 versus weeks 0 and 4 in the same group. B, Peak rotational responses after chronic daily treatment with levodopa (n = 13) or saline (n = 8). A significant difference occurred only in the group receiving daily levodopa treatment. *p < 0.01 versus day 1 (one-way ANOVA for repeated measures followed by Fisher's PLSD; error bars indicate SEM). All these behavioral changes occurred in the rAAV-ΔFosB group with much fewer levodopa administrations compared with what is typically required during chronic treatment (Table 1). For instance, limb dyskinesias that developed after 15 exposures to levodopa with twice daily injections were exhibited in as early as the first levodopa test after rAAV-ΔFosB infusion. Therefore, the behavioral changes in rats with rAAV-ΔFosB infusion cannot be attributed to test repetition or cumulative levodopa exposure. A substantially higher ΔFosB expression was associated with viral vector-mediated gene delivery compared with that induced by chronic levodopa administration (see ΔFosB expression) (Figs. 3A, 4A), and this difference likely accounts for the earlier manifestations of AIMs in the former group. The comparison of FosB-immunostained neurons among animal groups is shown in Table 2. Striatal transgene expression induced by rAAV vector infusions. 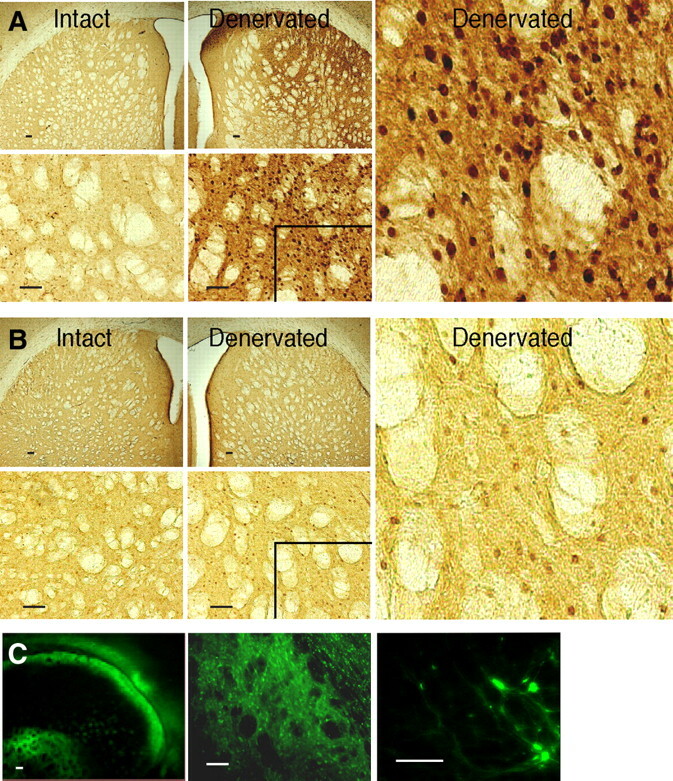 FosB IHC in the striatum of rats with unilateral 6-OHDA lesions that were infused in the denervated striatum with rAAV-ΔFosB (A) or rAAV-GFP (B). Animals were killed 12 weeks after viral vector infusion. In each panel (A, B), first row, shown are lower-power images of the denervated and intact striatum; second row, the corresponding higher-power images; right, digitally magnified images of the inlets in the denervated sides to visualize specific FosB nuclear staining. rAAV-ΔFosB infusion (A) induced a profound increase of FosB expression. rAAV-GFP infusion (B) did not affect FosB expression beyond the expected change resulting from dopamine denervation (for comparison of FosB-immunoreactive neurons in dopamine-denervated sides between rAAV-GFP infusion and saline treatment groups, see Table 2). GFP immunofluorescence (C) in the striatum of rats infused with rAAV-GFP. The distribution of GFP-positive cells indicates successful virus infection in the control group. Scale bars, 100 μm. Striatal overexpression of FosB induced by chronic levodopa treatment. FosB IHC in the striatum of rats with unilateral 6-OHDA lesions that were chronically treated with levodopa (A) or saline (B) twice daily for 4 weeks. Animals were killed at the end of the fourth week of treatment. A marked increase of FosB expression was found after chronic drug exposure, as demonstrated by comparing the denervated sides between the two treatment groups (A, B). A significant difference in FosB immunostaining was yet induced by dopamine denervation, as seen in the saline-treated group (denervated vs intact side in B). Scale bar, 100 μm. We examined the efficiency of rAAV-mediated gene transfer when animals were killed 12 weeks after viral vector infusion. High striatal expression of FosB proteins was detected by immunostaining in brain slices of rats injected with rAAV-ΔFosB (Fig. 3A). The infection with this vector diffused extensively from the injection sites to cover large regions of the striatum ipsilateral to the 6-OHDA lesion. Infusion of the control rAAV-GFP vector did not alter striatal expression of FosB beyond the increase expected from chronic denervation (Dragunow et al., 1995) (Fig. 3B) as it was comparable with that seen in denervated saline-treated rats that did not receive virus infusions (Table 2, Fig. 4B). However, the efficiency of rAAV-GFP infection was confirmed by GFP immunofluorescence (Fig. 3C). Thus, the robust staining of FosB proteins in the group infused with rAAV-ΔFosB was produced by the specific transgene expression. The extent of viral expression was similar across animals infused with rAAV-ΔFosB (quantitative immunoreactive neuron data of individual animals are shown in supplemental Table S1, available at www.jneurosci.org as supplemental material). All animals that received viral vector infusions had a complete unilateral lesion of the nigrostriatal pathway defined as >95% cell loss. The extent of the dopaminergic lesion was confirmed by cell count in the substantia nigra with TH immunostaining (supplemental Fig. S1, available at www.jneurosci.org as supplemental material). Analogous to the findings in the rAAV-ΔFosB group, FosB expression increased significantly in the striatum ipsilateral to the lesion in animals that were treated chronically with twice daily levodopa injections (Fig. 4A). Comparison of the immunostaining signal between chronic levodopa- and saline-treated groups showed the expected differential effects of denervation and chronic levodopa exposure on FosB expression (Fig. 4A,B), which are parallel to the immunostaining findings in viral vector-infused groups (Fig. 3). The equivalent increase in FosB expression in both the saline-treated and rAAV-GFP-infused groups demonstrates the effect of denervation. The additional increase in FosB expression induced by chronic levodopa treatment was reproduced to an even greater extent by rAAV-ΔFosB infusion (Table 2). The extent of the dopaminergic lesion was also confirmed by cell count in the substantia nigra with TH immunostaining in animals included in the chronic levodopa treatment groups (daily drug injections). All rats had a complete unilateral lesion defined as >95% cell loss (supplemental Fig. S1, available at www.jneurosci.org as supplemental material). As the immunohistochemical staining showed, rAAV-ΔFosB infusion resulted in high transgenic expression of FosB proteins in the striatum (Fig. 3A). The antibody used in these assays reacts with the N terminus of FosB/ΔFosB, and since the plasmid was constructed with ΔFosB cDNA, the protein highly expressed in the rAAV-ΔFosB group is presumably ΔFosB. Immunoblotting confirmed overexpression of proteins corresponding to 33–37 kDa in the side ipsilateral to the lesion in rats with rAAV-ΔFosB infusion (Fig. 5A,B). Different isomers of ΔFosB (35 kDa) are known to expand a range of ±2/3 kDa. All other bands >37 kDa were unchanged by the infusion of rAAV-ΔFosB. Quantification of ΔFosB proteins also showed similar distribution of transgene expression across animals infused with rAAV-ΔFosB (see immunoblotting data of individual rats in supplemental Table S1, available at www.jneurosci.org as supplemental material). Striatal overexpression of ΔFosB induced by viral vector-mediated gene transfer. 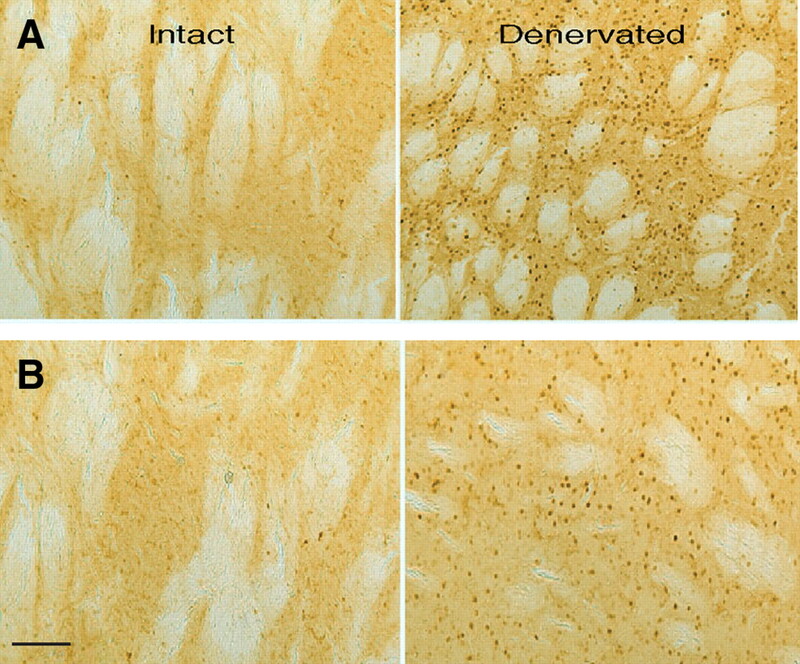 A–D, Immunoblot analysis of ΔFosB proteins in the striatum after rAAV-ΔFosB or rAAV-GFP infusions (A, B) and after chronic levodopa or saline treatment (C, D). The graphs (B, D) depict the quantification of ΔFosB expression as percentage of GAPDH in each striatal side for each group. CL, Contralateral (intact) side; IL, ipsilateral (denervated) side. ∧p < 0.05 and *p < 0.01 versus the other side in the same group; **p < 0.01 versus the same side in the other group (two-way ANOVAs; error bars indicate SEM). Western blot analysis of striatal ΔFosB expression also confirmed the similar profile between chronic levodopa treatment and viral vector-mediated gene transfer. In addition to enhanced ΔFosB expression, chronic levodopa treatment also increased the 40 kDa band that likely corresponds to FRA1 and 2 (Nye and Nestler, 1996) (Fig. 5C). The pattern of protein levels in both control groups (rAAV-GFP and chronic saline injections) also showed similar quantitative differences between the ipsilateral (denervated) and the contralateral (intact) sides. We tested the possibility whether the expression of JunD, which participates in AP-1-mediated regulation of late response genes, could increase secondary to ΔFosB changes after rAAV-ΔFosB infusion and thereby could play a role in the development of dyskinesias. This was not the case, as the number of striatal JunD-immunoreactive cells (supplemental Fig. S2, available at www.jneurosci.org as supplemental material) and the expression of JunD-immunoreactive proteins (supplemental Fig. S4A, available at www.jneurosci.org as supplemental material) were not different between the rAAV-ΔFosB-infused group and the control rAAV-GFP-infused animals. A typical nuclear staining that was substantially higher in the denervated striatum compared with the intact contralateral side was observed in both viral vector-infused groups (Table 3). The effect of 6-OHDA lesion on JunD expression was also seen in both levodopa- and saline-treated animals (supplemental Figs. S3, S4C, available at www.jneurosci.org as supplemental material). The pattern of JunD changes was consistent across all treatment groups showing similar differences between the denervated and intact sides (supplemental Fig. S4B,D, available at www.jneurosci.org as supplemental material; Table 3). Thus, the increased JunD expression induced by dopaminergic lesions may contribute to the mechanisms of dyskinesias, but the critical role of ΔFosB overexpression does not depend on concordant changes in JunD levels. Together, these data show the specific involvement of ΔFosB proteins in the molecular events leading to the development of altered dopamine responses after chronic drug exposure. Our results show that transgenic overexpression of ΔFosB in the striatum of dopamine-deficient rats can induce altered responses to single levodopa doses characterized by abnormal involuntary movements and other motor complications that ordinarily take chronic levodopa treatment to appear. This is the first reproduction of abnormal motor responses to dopaminergic treatment by manipulating the molecular milieu of the striatum, pointing to the key role of the targeted protein, ΔFosB. Overexpression of this transcription factor in the striatum was sufficient to produce a major switch in the responsiveness to dopaminergic stimulation that translates into the expression of different types of involuntary movements, and exaggerated (hypersensitive) motor activity, all encountered in chronically treated patients with advanced Parkinson's disease. The changes induced by striatal rAAV-ΔFosB infusion in most categories of AIMs as well as in the magnitude of rotational behavior were clearly paralleled in the animals chronically treated with levodopa. These changes of motor responses to levodopa may be attributed to altered postsynaptic mechanisms in contrast to presynaptic mechanisms, such as changes in the distribution and availability of levodopa developed during chronic exposure, that have been implicated in other motor fluctuations (e.g., the “wearing-off” phenomenon) of parkinsonian patients (Fabbrini et al., 1988; Nutt and Holford, 1996). Results of our experiments demonstrate that levodopa-induced AIMs and rotational hypersensitivity appear to be dependent mostly, if not entirely, on postsynaptic mechanisms mediated by ΔFosB. Important technical considerations relate to the effectiveness of rAAV infection and gene transfer demonstrated in the rAAV-ΔFosB and the control rAAV-GFP groups with clear differences in behavioral responses to levodopa and striatal protein expression. A clear behavioral effect of transgenic ΔFosB expression was evident rapidly after a period of 4 weeks, which corresponds with the average peak transduction time for most AAV serotypes (Reimsnider et al., 2007). Behavioral changes occurred with widespread distribution of ΔFosB overexpression in the striatum. It is possible that a more restricted distribution to the sensorimotor areas of the striatum would suffice to induce motor behavioral changes. However, limiting such striatal areas for viral infusions in the rat may not be accurate and was not intended in these experiments. Another relevant point is the standard dose of levodopa used in these experiments (25 mg/kg), which could not explain the early appearance of AIMs. Such a response is usually infrequent at this dose yielding nonsignificant group differences in the initial tests, as seen in the control rAAV-GFP group. Conversely, the majority of rats that received rAAV-ΔFosB infusions showed AIMs at the earliest levodopa test. The use of lower levodopa doses (6–15 mg/kg) introduces high variability in the development of AIMs, averaging only 50% of the animals exhibiting AIMs after several weeks of treatment (Cenci et al., 1998). In contrast, the moderate levodopa doses that were selected here ensure consistency of AIMs across animals after chronic administration (Crittenden et al., 2009). Additionally, moderate doses are known to induce changes in rotational responses (Papa et al., 1994; Dunah et al., 2000) that are not well reproduced with lower doses. Finally, it is highly unlikely that weekly levodopa doses and test repetition account for the observed effect of ΔFosB gene transfer since the control rAAV-GFP group that received the same levodopa doses and number of injections exhibited far less of these response abnormalities. The implications of these results are tied to the significance attributed to AIMs in the rat (Cenci et al., 1998; Lee et al., 2000; Lundblad et al., 2002). Hence, it could be assumed that ΔFosB upregulation plays a similar role in the dyskinesias developed in primates (Doucet et al., 1996; Calon et al., 2000). 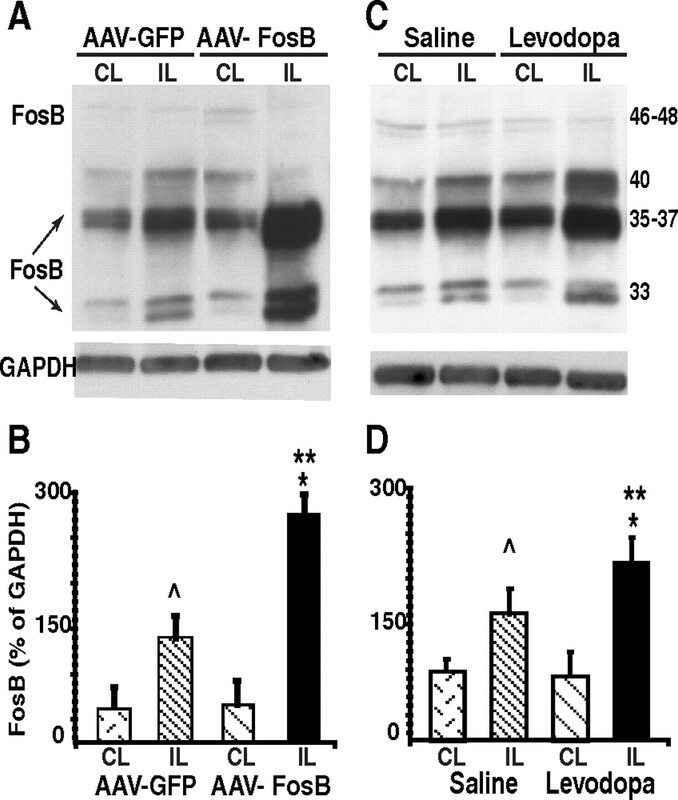 Although studies aimed at replicating dyskinesias by using transgenic overexpression of ΔFosB in advanced parkinsonian monkeys naive of dopaminergic treatment are yet to be carried out, indirect inhibition of ΔFosB activity in parkinsonian and dyskinetic monkeys has been shown to reduce the severity of dyskinesias (Berton et al., 2009). Additional support for a central role of ΔFosB derives from the time course of its overexpression in animal models, demonstrated in this and previous studies (Dragunow et al., 1995; Doucet et al., 1996), that begins with dopamine denervation and progresses with chronic drug treatment. Although dyskinesias have been described in normal monkeys treated with high doses of levodopa (Pearce et al., 2001), the typical development of dyskinesias with standard levodopa doses in parkinsonian monkeys (Di Monte et al., 2000) is congruent with the time course of ΔFosB overexpression. Similarly, in parkinsonian patients, motor complications usually occur with advanced denervation and chronic drug therapy. In addition, the high stability of ΔFosB (∼10 h half-life) that is regulated by protein phosphorylation (Ulery et al., 2006) may be responsible for persistent molecular changes even with pulsatile drug stimulation. This indicates that intermittent drug administration, as commonly occurs during chronic therapy in parkinsonian patients, may not translate into large oscillations in ΔFosB-regulated genes. Rather, sustained overexpression of ΔFosB and activation of its target genes can lead to abnormal motor responses to individual doses of dopaminergic drugs. FosB/ΔFosB-like and JunD proteins account for most of the DNA-binding activity at both AP-1 and CRE (cAMP response element) sites in the dopamine-denervated striatum after chronic levodopa treatment (Andersson et al., 2001). However, our findings show that ΔFosB overexpression is not associated with similar changes in JunD in either treatment condition, be it striatal rAAV-ΔFosB infusion or chronic levodopa administration (JunD increased after denervation and remained unchanged after levodopa treatment). Nevertheless, ΔFosB may also form homodimers with AP-1-site binding ability, particularly after its accumulation in high levels (Jorissen et al., 2007), and this mechanism may underlie the effects of rAAV-ΔFosB infusion. This has important pathophysiologic implications. High levels of ΔFosB may “independently” lead to specific changes in gene expression and trigger pathogenic cascades causing dyskinesias in response to dopamine-mediated signaling. ΔFosB is consistently expressed in dynorphin-positive striatal neurons (Andersson et al., 1999; Kelz et al., 1999), which express the dopamine D1 receptor and project into the direct output pathway (Gerfen et al., 2002). Notably, supersensitive responses to dopaminergic stimulation in rats with 6-OHDA lesions are associated with activation of extracellular-signal regulated kinases 1 and 2/mitogen-activated kinase (ERK1/2/MAP) in neurons of the direct pathway (Gerfen et al., 2002). Moreover, levodopa-induced AIMs correlate with striatal changes in the regulators of ERK, CalDAG-GEFI, and CalDAG-GEFII (RasGRP) (Crittenden et al., 2009). Accumulating evidence indicates that development of motor complications in rodent models correlates with striatal ERK1/2 and cAMP/DARPP-32 phosphorylation dependent on D1 receptor-mediated mechanisms (Picconi et al., 2003; Santini et al., 2007; Westin et al., 2007). However, studies intended to establish a link between these signaling molecules and ΔFosB through their colocalization in subpopulations of striatal neurons have shown contradictory results (Pavón et al., 2006; Westin et al., 2007). More importantly, both striatal output pathways have been implicated in the mechanisms of dyskinesias, which, in fact, can be elicited by dopamine D1 or D2 agonists (Obeso et al., 2000; Jenner, 2008). In agreement with several lines of evidence (Ingham et al., 1998; Calon et al., 2002; Papa et al., 2004), recent electrophysiologic studies in monkeys have indicated that dyskinesias are associated with hyperactivity and increased transmission at glutamatergic synapses in both striatal pathways (Liang et al., 2008). Such striatal dysregulation may be caused by changes at the level of receptor subunits or other molecules involved in glutamate signaling, some of which have genes with AP-1 sites. For example, genes of NMDA receptor subunits that are highly expressed in striatal neurons after chronic dopaminergic treatment can be upregulated by ΔFosB overexpression (Qiang and Ticku, 2005; Xu et al., 2009). Thus, the identification of ΔFosB-upregulated genes in models of dyskinesias may help elucidate the molecular mechanisms of striatal dysregulation and point to the design of target-specific therapies. This work was supported by National Institutes of Health Grant NS045962 and an Emory University Research Program grant (S.M.P.). M.M.M. is the William Dow Lovett Professor of Neurology at University of Medicine and Dentistry of New Jersey–Robert Wood Johnson Medical School. We thank Jessica S. Whithear for her technical support. (2001) cAMP response element-binding protein is required for dopamine-dependent gene expression in the intact but not the dopamine-denervated striatum. J Neurosci 21:9930–9943. (2003) Time course of striatal DeltaFosB-like immunoreactivity and prodynorphin mRNA levels after discontinuation of chronic dopaminomimetic treatment. Eur J Neurosci 17:661–666. (2009) Striatal overexpression of ΔJunD resets l-DOPA-induced dyskinesia in a primate model of Parkinson disease. Biol Psychiatry 66:554–561. (2000) Dopamine-receptor stimulation: biobehavioral and biochemical consequences. Trends Neurosci 23:S92–S100. (2002) Alteration of glutamate receptors in the striatum of dyskinetic 1-methyl-4-phenyl-1,2,3,6-tetrahydropyridine-treated monkeys following dopamine agonist treatment. Prog Neuropsychopharmacol Biol Psychiatry 26:127–138. (1998) l-DOPA-induced dyskinesia in the rat is associated with striatal overexpression of prodynorphin- and glutamic acid decarboxylase mRNA. Eur J Neurosci 10:2694–2706. (2009) Dysregulation of CalDAG-GEFI and CalDAG-GEFII predicts the severity of motor side-effects induced by anti-parkinsonian therapy. Proc Natl Acad Sci U S A 106:2892–2896. (2000) Relationship among nigrostriatal denervation, parkinsonism, and dyskinesias in the MPTP primate model. Mov Disord 15:459–466. (1996) Chronic alterations in dopaminergic neurotransmission produce a persistent elevation of ΔFosB-like protein(s) in both the rodent and primate striatum. Eur J Neurosci 8:365–381. (1995) Prolonged expression of Fos-related antigens, Jun B and TrkB in dopamine-denervated striatal neurons. Brain Res Mol Brain Res 30:393–396. (2000) Alterations in subunit expression, composition, and phosphorylation of striatal N-methyl-d-aspartate glutamate receptors in a rat 6-hydroxydopamine model of Parkinson's disease. Mol Pharmacol 57:342–352. (1988) Motor fluctuations in Parkinson's disease: central pathophysiological mechanisms, Part I. Ann Neurol 24:366–371. (1998) Plasticity of synapses in the rat neostriatum after unilateral lesion of the nigrostriatal dopaminergic pathway. J Neurosci 18:4732–4743. (2008) Molecular mechanisms of l-DOPA-induced dyskinesia. Nat Rev Neurosci 9:665–677. (2007) Dimerization and DNA-binding properties of the transcription factor ΔFosB. Biochemistry 46:8360–8372. (2000) Embryonic ventral mesencephalic grafts improve levodopa-induced dyskinesia in a rat model of Parkinson's disease. Brain 123:1365–1379. (2008) Inversion of dopamine responses in striatal medium spiny neurons and involuntary movements. J Neurosci 28:7537–7547. (2002) Pharmacological validation of behavioural measures of akinesia and dyskinesia in a rat model of Parkinson's disease. Eur J Neurosci 15:120–132. (2006) Motor complications in Parkinson's disease and the clinical significance of rotational behavior in the rat: have we wasted our time? Exp Neurol 197:269–274. (2001) An AAV-derived Apaf-1 dominant negative inhibitor prevents MPTP toxicity as antiapoptotic gene therapy for Parkinson's disease. Proc Natl Acad Sci U S A 98:10918–10923. (2001) ΔFosB: a sustained molecular switch for addiction. Proc Natl Acad Sci U S A 98:11042–11046. (1996) The response to levodopa in Parkinson's disease: imposing pharmacological law and order. Ann Neurol 39:561–573. (1994) Motor fluctuations in levodopa treated parkinsonian rats: relation to lesion extent and treatment duration. Brain Res 662:69–74. (2004) Prolongation of levodopa responses by glycineB antagonists in parkinsonian primates. Ann Neurol 56:723–727. (2001) l-Dopa induces dyskinesia in normal monkeys: behavioural and pharmacokinetic observations. Psychopharmacology (Berl) 156:402–409. (2005) Role of AP-1 in ethanol-induced N-methyl-d-aspartate receptor 2B subunit gene up-regulation in mouse cortical neurons. J Neurochem 95:1332–1341. (2007) Time course of transgene expression after intrastriatal pseudotyped rAAV2/1, rAAV2/2, rAAV2/5, and rAAV2/8 transduction in the rat. Mol Ther 15:1504–1511. (2007) Critical involvement of cAMP/DARPP-32 and extracellular signal-regulated protein kinase signaling in l-DOPA-induced dyskinesia. J Neurosci 27:6995–7005. (2001) Elevated levels of ΔFosB and RGS9 in striatum in Parkinson's disease. Biol Psychiatry 50:813–816. (2006) Regulation of ΔFosB stability by phosphorylation. J Neurosci 26:5131–5142. (2007) Expression pattern of JunD after acute or chronic l-DOPA treatment: comparison with ΔFosB. Neuroscience 144:198–207. (1997) Behavioural sensitization in 6-hydroxydopamine-lesioned rats is related to compositional changes of the AP-1 transcription factor: evidence for induction of FosB- and JunD-related proteins. Brain Res Mol Brain Res 52:307–317. (2007) Spatiotemporal pattern of striatal ERK1/2 phosphorylation in a rat model of l-DOPA-induced dyskinesia and the role of dopamine D1 receptors. Biol Psychiatry 62:800–810. (2009) Quantitative autoradiographic study on receptor regulation in the basal ganglia in rat model of levodopa-induced motor complications. J Huazhong Univ Sci Technolog Med Sci 29:156–162. (2007) Neuronal specificity of alpha-synuclein toxicity and effect of Parkin co-expression in primates. Neuroscience 144:743–753.